This chained human is now free. Recent leaks have revealed a new skin called The Prisoner that is likely the season seven special Snowfall skin. The leak was made by Lucas7yoshi, and the confirmation should come this Thursday in Fortnite: Battle Royale for players who complete 60 weekly challenges total. The Snowfall skin is the humanoid creature that was chained under the Ice Castle in Polar Peaks. If the skin is actually The Prisoner, then he might have something to do with the upcoming lore of Fortnite: Battle Royale season seven. The Prisoner had parts of its body revealed when a huge ice block under the Ice Castle started melting. 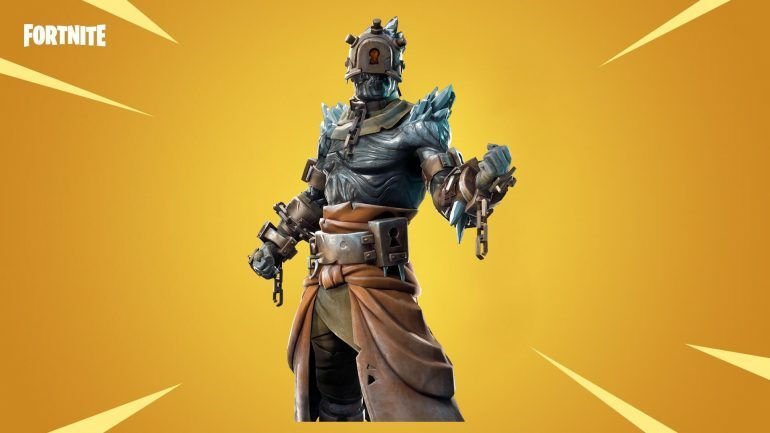 He was in a prison area that became accessible to players midway through the season, and before the v7.30 update all players could see was his arm sticking out of the ice block with heavy chains around it. After the v7.30 update, all the ice under the castle has melted and The Prisoner freed himself from the chains. It’s very likely that The Prisoner is really the Snowfall skin. In season six, a parachute on Flush Factory gave us a preview of the Hunting Party skin, A.I.M., so the chained humanoid under Polar Peak is very likely a teaser for The Prisoner skin as well. Another leaker was able to reveal the styles of The Prisoner. As players unlock them, The Prisoner reveals himself as someone who is made of magma or who can bend fire. We might only be sure about how the skin works after completing some challenges from week eight and unlocking the Snowfall outfit this Thursday.